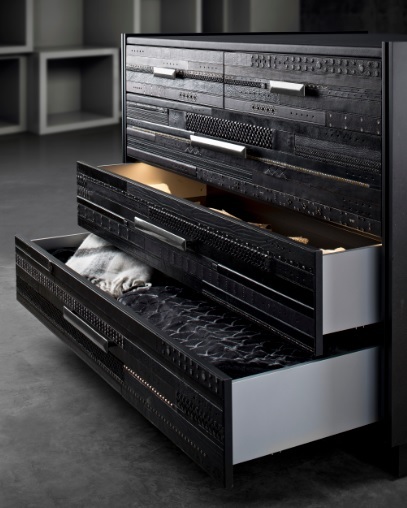 Here at Häfele America Co., one of our quests is to make the inside of cabinets and drawers just as beautiful and functional as the exterior. The selection of functional hardware on display at KBIS 2017 drives this notion by allowing designers to extend their vision beyond the cabinet door and drawer front. Drawer boxes, drawer slides, hinges, and their associated components generate the awe in your kitchen, bath, furniture and closet designs. These are the “little invisibles” that soldier on allowing the open, the close and the open again to happen each time with precision, perfection and style. Häfele’s all-new MX drawer system is the new go-to option for kitchens, bathrooms, offices, stores and beyond. This European-style, double walled drawer system features sleekly designed standard and deep depth drawers on high-quality runners. Available MX finishes include White, Anthracite and Champagne. Installers will love its easy installation and tool-less adjustability. Customers will love the MX’s beauty coupled with years of trouble-free performance. Also bringing an amazing level of inspired style to Häfele’s KBIS booth is the Grass Vionaro which brings simple, clean lines in an ultra-sleek package. Vionaro offers an incredible level of easy, tool free adjustment with under mounted Grass Dynapro slides featuring built in synchronization. Available finishes include Silver Gray and Graphite. Of particular interest to designers is the bottom mounted Salice Shelf which allows you to install a pull-out shelf practically anywhere without having to trim it to fit between slides. Think about it: that means that, within reason almost any material or item can be turned into an extendable shelf. Just two runners hold up to 75 lbs. Now that’s what we call opening the possibilities!